When I was at EGX, I mentioned on Twitter that I hadn’t played anything from the Assassin’s Creed series since the high-seas action of Black Sails, but that was about to change as I was in the queue for Syndicate, the latest game in the series that will be taking us to Victorian London. I also took some fairly ropey photos of Ubisoft’s booth for the game, but that’s by-the-by. I played Syndicate at the show, not once, but twice. Both times, I was impressed. It probably helps that I jumped onto the game without any preconceived ideas of what it was going to be like. 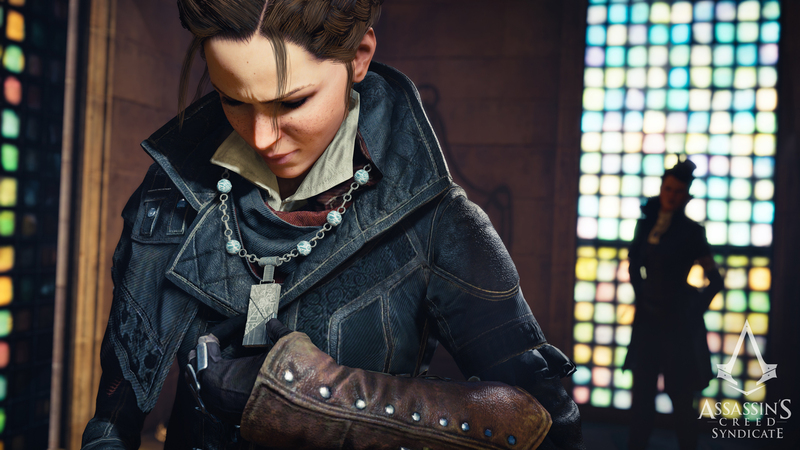 I have largely avoided any news stories about Syndicate, and before getting hands on with the game, I hadn’t even watched any trailers for the game. Shocking I know, but after several years of continuous Assassin’s Creed action, I was burnt out. Following the doom and gloom that surrounded Unity, I was about ready to give up on the series. Yet, after giving Syndicate a whirl at EGX, I’m prepared to give the series a second chance. Don’t get me wrong, some long-standing niggles with the series remain namely, combat. I’ve always got along with the fighting in Assassin’s Creed, but I’ve never felt there was any depth to it. You start a fight, throw in some counters, kick someone to break their guard, and as long as you aren’t stupid, you should have a good chance of coming out victorious. The combat has never had the depth of other 3rd person melee fighters like Batman, but I still feel an urge to experience something more in the game. So the combat might not be vastly different to before and there is another aspect of the game which struck me as plain dumb. It wasn’t the piles of hay (I love swan-diving into them), but the immersion breaking moment after you kill your target. After swooping down to kill my target when she was still surrounded by guards, suddenly I was taken to the special world view where your target shares some final words of wisdom or doom and nobody else exists. I enjoyed this type of moment way back in Ezio’s time when he muttered the famous words, “requiescat in pace”. But now, I can do without this type of thing. Putting all of that to one side, and Syndicate is on a strong footing. The mission I played, with the objective of eliminating Lucy Thorne in the Tower of London was (unknown to me) previously demo’d by Ubisoft (see the video below). This type of level is known as a Black Box Mission where a variety of routes to your objective are open to you. I wasn’t hamstrung by automatic mission failures at any point, and I didn’t necessarily have to follow one of the options that was shown to me. This is the type of mission Assassin’s Creed should always have been about, and it is one that I really enjoyed. In the video, the Ubisoft man talks about 360 degree player control in these mission types, and I just wonder why it has taken until now for this play-style to be embraced. Not everyone wants to be forced into approaching a mission in the same way. On my first taste of the demo, I patiently waited for the boat to come to a stop, walked around a bit and took the same route to the vantage point as in the video above. From the ensuing low-down of possible options, I chose to keep the law on my side and decided to assist the Constable who was being kept under lock and key. I used the awesome grappling hook to rappel between parts of the Tower, then skulked through the gardens. I distracted some guards and found my way into the building where the Constable was being kept. I took down a few of his guards quickly and quietly, then went on the hunt for a key to free him. Downstairs I went, and blundered my way into a mothers meeting for some more bad guys. Combat ensued, I won (of course), and I rescued the noble Constable. He promised me support from guards who were still loyal to him in the hunt for Thorne. I clambered my way over to the building where Thorne lay in wait, and soon heard different groups of NPCs getting into fisticuffs. The Constable’s men were doing a fine job in taking on Thorne’s guards, but this had alerted the target to the fact that things weren’t all rosy. I stumbled across her walking the corridors, eliminated her guard and then dispatched her. Good times all round, especially as I didn’t necessarily complete my mission quite as the Constable (and in turn, the game) had in mind. I think the friendly Constable had expected me to walk into Thorne’s lair with his loyal men, but I took my own route, and was pleased that the game let me. Evie, now she seems pretty cool. When I returned to the demo for a second test, I took a different approach. Rather than wait for the boat to dock, I jumped off straight away and hopped my way over debris in the Thames to reach the same gate as I did first time round. I had the same end goal of finding the vantage point undetected, but got there in my own fashion. In the walkthrough video, our Ubisoft chap decides to approach an ally who had taken down a Templar guard. I did the same thing on my second go…but then quickly diverted paths. On my way to take down the first of the remaining two Templar guards, I was spotted by a genuine Tower guard who unfortunately had to be put down. Along with one or two of his buddies. I didn’t make best use of Evie’s special sneaky abilities if I have to be honest. Regardless, I had killed some good guys (which didn’t end the mission! Hooray!) along with a Templar. I initially planned to follow the correct order and kill the second Templar, but while trying to hunt him down, I was spotted in the gardens, and had to dispatch another good guard along with chap who was carrying the set of master keys to the tower. Somehow, I had managed to take myself down two of the routes that were open to me, and while going on this mini-rampage, I could hear people in the queue commenting on my wild and bombastic approach. With the master keys in my possession, I proceeded to Thorne’s building, took down the other evil Templar and proceeded to work my way through the building towards Thorne. My rustiness with Assassin’s Creed showed up here, as rather than take Thorne down smoothly…I landed in the middle of her guards and all hell was let loose. At least, it was let loose until I killed Thorne with a few guards still left alive, which immediately led to the post-assassination cut-scene. Mood breaking of course. What is more important than combat or immersion breaking moments, is that this mission showed me that with Syndicate, you aren’t hamstrung by many of the series’ strict rules and regulations. You can go off the beaten path, and you won’t be told that you have failed the mission. While the above walkthrough video shows a more structured approach to a mission while playing as Evie’s brother, the introduction of carriages and trains means London will feel a lot more alive than the locales of previous games. I might have been impressed by the demo at EGX, and the London setting really appeals to me, but I’m not going to get my expectations raised unduly. I’ll keep a level head, and expect some of the usual ups and downs to arise during the game. But at least I’m starting to re-find my enthusiasm for Assassin’s Creed.